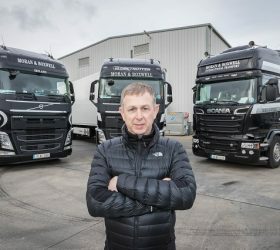 Ray Moran International Transport, the Co. Wexford-based groupage and pharma transport specialist reports easier loading and additional capacity since adding a further 10 Krone trailers to its fleet. 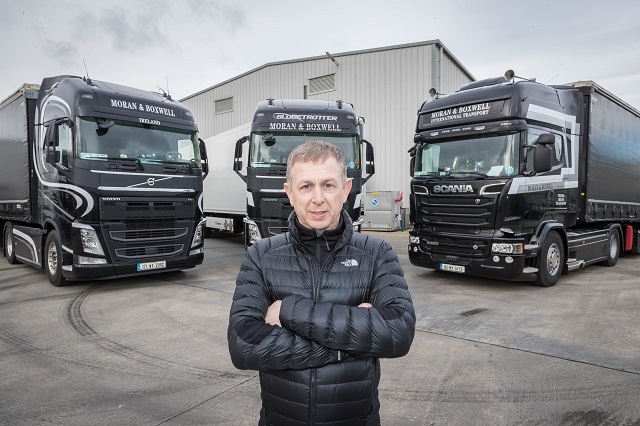 Now in its 20th year Ray Moran, incorporating Moran and Boxwell International, runs a multi-national haulage operation via all major Irish and UK sea ports throughout Europe, including Germany, The Netherlands, Belgium, Switzerland, France and Spain. The Cool Liner, manufactured at Krone’s Lubtheen plant in Germany, is fitted with Krone’s new ISOWALL moveable bulkhead, which is ideal for mixed temperature loads. A newly designed balancer system combined with a locking lever positioned at the top of the bulkhead, makes the ISOWALL easy to open, close and slide along the trailer. Also, due to the vertical movement of the bulkhead when opening and closing, no additional components are required for vacuum ventilation. Furthermore, when stowed to the roof, magnets hold the bulkhead in place, so there is no requirement for secondary locking or risk of fork lift obstruction. The Dry Liners, meanwhile, are manufactured at Krone’s Herzlake factory in Germany and are designed to work in both the UK and European markets: The slim, 100mm neck affords additional load volume and with a fifth wheel height of 1,250mm, a total height of 4,000mm allows an internal height of 2,615mm. Each of the Krone trailers is built to European Code XL (en12642xl) standard which, says Ray Moran, is an important quality badge for their customers throughout the continent.